The following recipes are for two of the foods that are often included in the Día De Los Muertos (Day of the Dead) celebration. Champurrado is an indigenous hot chocolate and spice drink that is thickened with corn meal. It is a winter favorite that is also traditionally served during the Christmas season. 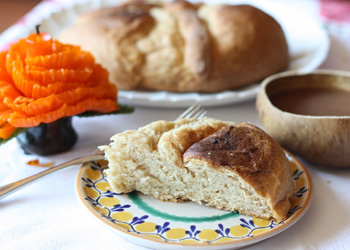 Pan the Muertos is a variation of the Pan Dulce that is a breakfast staple. The decoration of the bread depicts bones to remind us that our time on this earth is temporary. It is believed that this culinary delight developed from the Missionaries altar bread offering during the Catholic Mass rituals. The important ingredients that separate this from other "Pan Dulce" or sweet bread is the presence of anise seed, milk, orange zest, eggs and butter. Three quarters pound corn "masa" as used to make tamales (no lard or salt added) Not Masa Preparada. Prepare a tea with the water cinnamon and pilloncillo. When the tea is a golden brown color and good enough to drink on its own remove cinnamon sticks and continue to simmer. Add chocolate and canned milk. In a separate container, combine masa and cold milk. Use the whole milk to wisk masa into a smooth thick consistency. Strain into simmering tea mixture. Continue to simmer liquid for about twenty minutes at low heat to cook the masa. Stir constantly to avoid lumps and burning of drink. Serve piping hot! Heat milk, butter and water until butter are melted. Do not boil. Set aside Combine all dry ingredients. Wisk in milk and butter mixture, orange zest and beaten eggs. Sprinkle work area with flour. Knead dough. Set dough aside in lightly buttered bowl. Cover with wax paper or plastic wrap for about two hours or until dough increases to twice its size. Knead gently and separate into four small rounds loafs. Set aside enough dough to decorate with strips of dough in the shape of bones on top of bread. Place on baking sheet and bake in preheated oven at 350 degrees for 40 minutes or until golden brown. You may also decorate with a sugar glaze or sprinkle with colored sugar granules.